Explore data analysis with Python. Pandas DataFrames make manipulating your data easy, from selecting or replacing columns and indices to reshaping your data. Pandas is a popular Python package for data science, and with good reason: it offers powerful, expressive and flexible data structures that make data manipulation and analysis easy, among many other things. The DataFrame is one of these structures. This tutorial covers Pandas DataFrames, from basic manipulations to advanced operations, by tackling 11 of the most popular questions so that you understand -and avoid- the doubts of the Pythonistas who have gone before you. Does Pandas Recognize Dates When Importing Data? Before you start, let’s have a brief recap of what DataFrames are. Those who are familiar with R know the data frame as a way to store data in rectangular grids that can easily be overviewed. Each row of these grids corresponds to measurements or values of an instance, while each column is a vector containing data for a specific variable. This means that a data frame’s rows do not need to contain, but can contain, the same type of values: they can be numeric, character, logical, etc. Now, DataFrames in Python are very similar: they come with the Pandas library, and they are defined as two-dimensional labeled data structures with columns of potentially different types. In general, you could say that the Pandas DataFrame consists of three main components: the data, the index, and the columns. a Pandas Series: a one-dimensional labeled array capable of holding any data type with axis labels or index. An example of a Series object is one column from a DataFrame. dictionaries of one-dimensional ndarray’s, lists, dictionaries or Series. Note the difference between np.ndarray and np.array() . The former is an actual data type, while the latter is a function to make arrays from other data structures. Structured arrays allow users to manipulate the data by named fields: in the example below, a structured array of three tuples is created. The first element of each tuple will be called foo and will be of type int, while the second element will be named bar and will be a float. Record arrays, on the other hand, expand the properties of structured arrays. They allow users to access fields of structured arrays by attribute rather than by index. You see below that the foo values are accessed in the r2 record array. Besides data, you can also specify the index and column names for your DataFrame. The index, on the one hand, indicates the difference in rows, while the column names indicate the difference in columns. You will see later that these two components of the DataFrame will come in handy when you’re manipulating your data. Now that there is no doubt in your mind about what DataFrames are, what they can do and how they differ from other structures, it’s time to tackle the most common questions that users have about working with them! Obviously, making your DataFrames is your first step in almost anything that you want to do when it comes to data munging in Python. Sometimes, you will want to start from scratch, but you can also convert other data structures, such as lists or NumPy arrays, to Pandas DataFrames. In this section, you’ll only cover the latter. However, if you want to read more on making empty DataFrames that you can fill up with data later, go to question 7. Among the many things that can serve as input to make a ‘DataFrame’, a NumPy ndarray is one of them. To make a data frame from a NumPy array, you can just pass it to the DataFrame() function in the data argument. Pay attention to how the code chunks above select elements from the NumPy array to construct the DataFrame: you first select the values that are contained in the lists that start with Row1 and Row2, then you select the index or row numbers Row1 and Row2 and then the column names Col1 and Col2. Next, you also see that, in the DataCamp Light chunk above, you printed out a small selection of the data. This works the same as subsetting 2D NumPy arrays: you first indicate the row that you want to look in for your data, then the column. Don’t forget that the indices start at 0! For data in the example above, you go and look in the rows at index 1 to end, and you select all elements that come after index 1. As a result, you end up selecting 1, 2, 3 and 4. This approach to making DataFrames will be the same for all the structures that DataFrame() can take on as input. Remember that the Pandas library has already been imported for you as pd. Note that the index of your Series (and DataFrame) contains the keys of the original dictionary, but that they are sorted: Belgium will be the index at 0, while the United States will be the index at 3. These two options give you slightly different information on your DataFrame: the shape property will provide you with the dimensions of your DataFrame. That means that you will get to know the width and the height of your DataFrame. On the other hand, the len() function, in combination with the index property, will only give you information on the height of your DataFrame. This all is totally not extraordinary, though, as you explicitly give in the index property. You could also use df.count() to get to know more about the height of your DataFrame, but this will exclude the NaN values (if there are any). That is why calling .count() on your DataFrame is not always the better option. If you want more information on your DataFrame columns, you can always execute list(my_dataframe.columns.values). Try this out for yourself in the DataCamp Light block above! Now that you have put your data in a more convenient Pandas DataFrame structure, it’s time to get to the real work! This first section will guide you through the first steps of working with DataFrames in Python. It will cover the basic operations that you can do on your newly created DataFrame: adding, selecting, deleting, renaming, … You name it! Before you start with adding, deleting and renaming the components of your DataFrame, you first need to know how you can select these elements. So, how do you do this? In R, you use the [,] notation to access the data frame’s values. And you want to access the value that is at index 0, in column ‘A’. The most important ones to remember are, without a doubt, .loc and .iloc. The subtle differences between these two will be discussed in the next sections. For now, it’s enough to know that you can either access the values by calling them by their label or by their position in the index or column. If you don’t see this, look again at the slight differences in the commands: one time, you see , the other time, you see [0,'A'] to retrieve your value 1. Now that you have learned how to select a value from a DataFrame, it’s time to get to the real work and add an index, row or column to it! When you create a DataFrame, you have the option to add input to the ‘index’ argument to make sure that you have the index that you desire. When you don’t specify this, your DataFrame will have, by default, a numerically valued index that starts with 0 and continues until the last row of your DataFrame. However, even when your index is specified for you automatically, you still have the power to re-use one of your columns and make it your index. You can easily do this by calling set_index() on your DataFrame. Try this out below! .loc works on labels of your index. This means that if you give in loc, you look for the values of your DataFrame that have an index labeled 2. .iloc works on the positions in your index. This means that if you give in iloc, you look for the values of your DataFrame that are at index ’2`. .ix is a more complex case: when the index is integer-based, you pass a label to .ix. ix then means that you’re looking in your DataFrame for values that have an index labeled 2. This is just like .loc! However, if your index is not solely integer-based, ix will work with positions, just like .iloc. Note that in this case, you used an example of a DataFrame that is not solely integer-based as to make it easier for you to understand the differences. You clearly see that passing 2 to .loc or .iloc/.ix does not give back the same result! Since the index doesn’t only contain integers, .ix will have the same behavior as iloc and look at the positions in the index. You will get back the same result as .iloc. Now that the difference between .iloc, .loc and .ix is clear, you are ready to give adding rows to your DataFrame a go! Tip: as a consequence of what you have just read, you understand now also that the general recommendation is that you use .loc to insert rows in your DataFrame. That is because if you would use df.ix, you might try to reference a numerically valued index with the index value and accidentally overwrite an existing row of your DataFrame. You better avoid this! You can see why all of this can be confusing, right? In other words, you tell your DataFrame that it should take column A as its index. Remember a Series object is much like a column of a DataFrame. That explains why you can easily add a Series to an existing DataFrame. Note also that the observation that was made earlier about .loc still stays valid, even when you’re adding columns to your DataFrame! Now try replacing the drop argument by inplace in the code chunk above and see what happens! Note how you use the drop argument to indicate that you want to get rid of the index that was there. If you would have used inplace, the original index with floats is added as an extra column to your DataFrame. Now that you have seen how to select and add indices, rows, and columns to your DataFrame, it’s time to consider another use case: removing these three from your data structure. If you want to remove the index from your DataFrame, you should reconsider because DataFrames and Series always have an index. and lastly, remove an index, and with it a row. This is elaborated further on in this tutorial. Now that you know how to remove an index from your DataFrame, you can go on to removing columns and rows! You might think now: well, this is not so straightforward; There are some extra arguments that are passed to the drop() method! The axis argument is either 0 when it indicates rows and 1 when it is used to drop columns. You can set inplace to True to delete the column without having to reassign the DataFrame. You can remove duplicate rows from your DataFrame by executing df.drop_duplicates(). You can also remove rows from your DataFrame, taking into account only the duplicate values that exist in one column. After this command, you might want to reset the index again. Tip: try resetting the index of the resulting DataFrame for yourself! Don’t forget to use the drop argument if you deem it necessary. To give the columns or your index values of your dataframe a different value, it’s best to use the .rename() method. Tip: try changing the inplace argument in the first task (renaming your columns) to False and see what the script now renders as a result. You see that now the DataFrame hasn’t been reassigned when renaming the columns. As a result, the second task takes the original DataFrame as input and not the one that you just got back from the first rename() operation. Now that you have gone through a first set of questions about Pandas’ DataFrames, it’s time to go beyond the basics and get your hands dirty for real because there is far more to DataFrames than what you have seen in the first section. To replace certain strings in your DataFrame, you can easily use replace(): pass the values that you would like to change, followed by the values you want to replace them by. In short, replace() is mostly what you need to deal with when you want to replace values or strings in your DataFrame by others! Removing unwanted parts of strings is cumbersome work. Luckily, there is an easy solution to this problem! You use map() on the column result to apply the lambda function over each element or element-wise of the column. The function in itself takes the string value and strips the + or - that’s located on the left, and also strips away any of the six aAbBcC on the right. First, you inspect the DataFrame at hand. You see that the values in the last row and in the last column are a bit too long. It appears there are two tickets because a guest has taken a plus-one to the concert. That still doesn’t seem quite right. You have NaN values in there! You have to stack the Series to make sure you don’t have any NaN values in the resulting Series. Next, you see that your Series is stacked. That is what you’re looking for. Transform your Series to a DataFrame to make sure you can join it back to your initial DataFrame. However, to avoid having any duplicates in your DataFrame, you can delete the original Ticket column. Tip: if you want to know more about functions in Python, consider taking this Python functions tutorial. Note that you can also select the row of your DataFrame and apply the doubler lambda function to it. Remember that you can easily select a row from your DataFrame by using .loc or .iloc. Note that the apply() function only applies the doubler function along the axis of your DataFrame. That means that you target either the index or the columns. Or, in other words, either a row or a column. However, if you want to apply it to each element or element-wise, you can make use of the map() function. You can just replace the apply() function in the code chunk above with map(). Don’t forget to still pass the doubler function to it to make sure you multiply the values by 2. If you want more information on the flow of control in Python, you can always read up on it here. The function that you will use is the Pandas Dataframe() function: it requires you to pass the data that you want to put in, the indices and the columns. Remember that the data that is contained within the data frame doesn’t have to be homogenous. It can be of different data types! There are several ways in which you can use this function to make an empty DataFrame. Firstly, you can use numpy.nan to initialize your data frame with NaNs. Note that numpy.nan has type float. Note that if you don’t specify the axis labels or index, they will be constructed from the input data based on common sense rules. 8. Does Pandas Recognize Dates When Importing Data? There are, however, always weird date-time formats. No worries! In such cases, you can construct your own parser to deal with this. You could, for example, make a lambda function that takes your DateTime and controls it with a format string. Reshaping your DataFrame is transforming it so that the resulting structure makes it more suitable for your data analysis. In other words, reshaping is not so much concerned with formatting the values that are contained within the DataFrame, but more about transforming the shape of it. This answers the when and why. But how would you reshape your DataFrame? There are three ways of reshaping that frequently raise questions with users: pivoting, stacking and unstacking and melting. values: this argument allows you to specify which values of your original DataFrame you want to see in your pivot table. columns: whatever you pass to this argument will become a column in your resulting table. index: whatever you pass to this argument will become an index in your resulting table. Note the additional argument aggfunc that gets passed to the pivot_table method. This argument indicates that you use an aggregation function used to combine multiple values. In this example, you can clearly see that the mean function is used. You have already seen an example of stacking in the answer to question 5! In essence, you might still remember that, when you stack a DataFrame, you make it taller. You move the innermost column index to become the innermost row index. You return a DataFrame with an index with a new inner-most level of row labels. Go back to the full walk-through of the answer to question 5 if you’re unsure of the workings of stack(). The inverse of stacking is called unstacking. Much like stack(), you use unstack() to move the innermost row index to become the innermost column index. For a good explanation of pivoting, stacking and unstacking, go to this page. Melting is considered useful in cases where you have data that has one or more columns that are identifier variables, while all other columns are considered measured variables. These measured variables are all “unpivoted” to the row axis. That is, while the measured variables that were spread out over the width of the DataFrame, the melt will make sure that they will be placed in the height of it. Or, yet in other words, your DataFrame will now become longer instead of wider. As a result, you have two non-identifier columns, namely, ‘variable’ and ‘value’. If you’re looking for more ways to reshape your data, check out the documentation. iterrows() allows you to efficiently loop over your DataFrame rows as (index, Series) pairs. In other words, it gives you (index, row) tuples as a result. When you have done your data munging and manipulation with Pandas, you might want to export the DataFrame to another format. This section will cover two ways of outputting your DataFrame: to a CSV or to an Excel file. Don’t worry! You can pass some additional arguments to to_csv() to make sure that your data is outputted the way you want it to be! 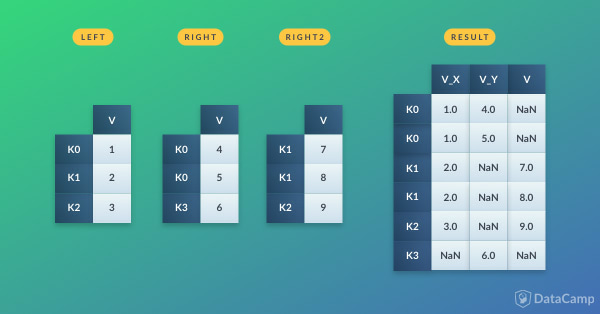 Furthermore, you can specify how you want your NaN or missing values to be represented, whether or not you want to output the header, whether or not you want to write out the row names, whether you want compression, … Read up on the options here. Note, however, that, just like with to_csv(), you have a lot of extra arguments such as startcol, startrow, and so on, to make sure output your data correctly. Go to this page to read up on them. If, however, you want more information on IO tools in Pandas, you check out this page. That’s it! You've successfully completed the Pandas DataFrame tutorial! The answers to the 11 frequently asked Pandas questions represent essential functions that you will need to import, clean and manipulate your data for your data science work. Are you not sure that you have gone deep enough into this matter? Our Importing Data In Python course will help you out! If you’ve got the hang out of this, you might want to see Pandas at work in a real-life project. The Importance of Preprocessing in Data Science and the Machine Learning Pipeline tutorial series is a must-read, and the open course Introduction to Python & Machine Learning is a must-complete.